Sedums are succulent plants that adorn the garden in areas where other plants have a difficult time growing, such as in rocky or clay soil. 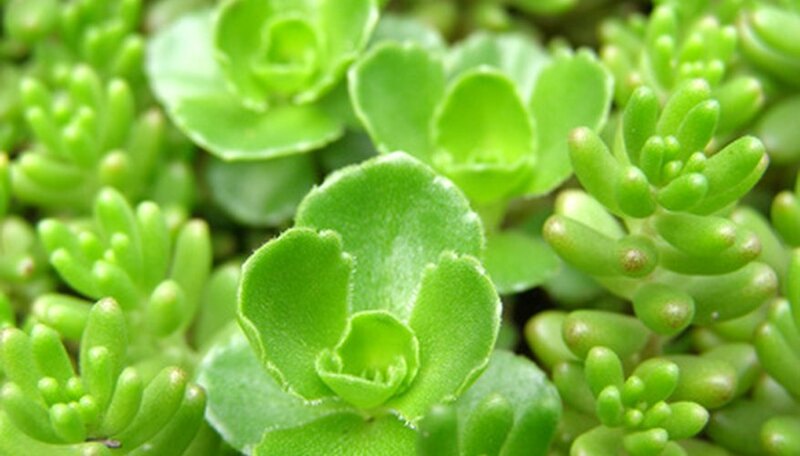 There are more than 400 species of sedum, some of which do well colder climates and others in tropical climates. Aphids are small, pear-shaped insects and on sedums, are dark green or greenish black insects. Aphids can cause sedums leaves to yellow, curl, twist and stop growing. Aphids also can carry diseases from plant to plant. Controlling aphids is a must when caring for sedums. Wash aphids off the sedums as a first course of action. Do so for three or four days in a row, in the morning. If that doesn’t work, spray an insecticidal soap on the aphids. Reapply every two or three days for up to two weeks. If this does not work, continue to Step 2. Put on clothing that protects your skin--especially if you have any open sores--and eyes from chemical contact, such as long-sleeve shirt, goggles, pants and closed-toe shoes with socks. Make sure children and pets are out of the way when you spray the pesticide. Apply a pesticide labeled to kill aphids, such as pyrethrum, to control aphids on sedums. Spray the pesticide directly on the aphids to kill them and on a day that is not windy and children and pets are safely indoors. Reapply as necessary, following reapplication recommendations on the label.